Apple Inc. (AAPL) is turning to the software engineer who built iTunes to help lead its development of a television set, according to three people with knowledge of the project. Jeff Robbin, who helped create the iPod in addition to the iTunes media store, is now guiding Apple’s internal development of the new TV effort, said the people, who declined to be identified because his role isn’t public. Bloomberg also mentions that Apple has a prototype in the works, and the TV set may be released sometime between 2012 and 2013. 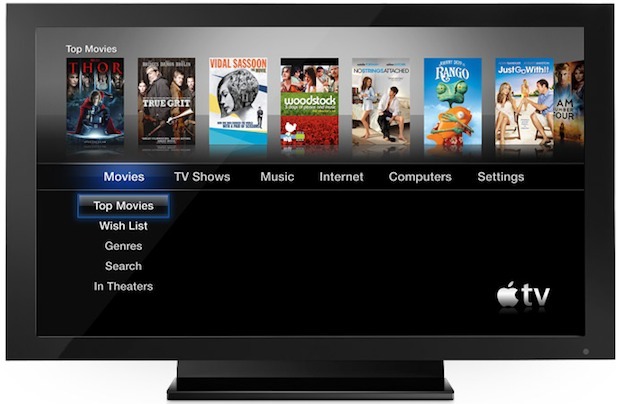 Two of the features of the HDTV set may be iCloud integration, which Steve Jobs himself mentioned, and the inclusion of Siri, the personal assistant and voice-based interface currently exclusive to the iPhone 4S. One of their sources does caution that “it’s not guaranteed that Apple will release a television”, and Bloomberg notes that outside of the comments made by Steve Jobs himself in his biography, Apple hasn’t acknowledged the projects existence, which isn’t unusual for the secretive company. The current Apple TV set-top box sells for $99 and runs a variation of iOS. I must say I do see it all converging somewhere down the line, of course it is inevitable and all part of the greater plan of Apple, whether knowingly or not, but it’s still exciting to watch it happen. One day I envisage your TV sits in your room and rather than be a device just to consume over the air TV shows it becomes one of the hubs of your lifestyle. It records shows you want to watch (as much as Apple want to sell you everything for now they’ll need to make a broadcast receivable device that uses PVR functionality). I hope you can pick up your iPad or iPhone on the go and tap into your recorded shows, whether off Apple directly, or off the networks. The TV will tap into your photos, music, magazines, the web, even appropriate apps that work across your devices. Siri, which will go onto be a consistent, truly intelligent and (hopefully) customisable part of the experience will be ever present, ever listening out for mention of it’s name and eventually be intelligent enough to join in conversation when it feels it is needed. You could literally sit with friends conversing about some TV show you all watch, casually mention a particular funny moment and Siri joins in and offers to show a clip to you, or maybe it’s asked in such a casual way that Siri/Apple becomes truly a part of your life, another member of your family in a way. Just ask to see the holiday snaps and it delivers. iCloud plugged into an evermore intelligent Siri ideal one day will help in all sorts of unforeseen ways. I’m sure this sort of truly futuristic yet conceivable image was what Steve Jobs has had in mind for a while now. It will be fantastic. iCloud and Siri allows Apple to muscle into your lifestyle in a far more present manner than it has done thus far, to the point where it will be hard to imagine living without it. Scary thought perhaps but we couldn’t live without cars in our modern era, in the future we may struggle to live without our digital assistants holding our digital lifestyle history in the cloud. Furthermore, the technological revolution has been swift and has changed society more than anything that has come before it but it is still such a young revolution still finding its feet and finding new ways to deliver its revolution. We really are just at the forefront, the very begin when you really think about it. As much as technology and software seems advance, the fact is a human has to either touch up a device through tedious menus just to set up something simple like an alarm, to create a digital work of art requires even more complex tools and to do much more requires a degree. All useful skills but not one everyone should be expected to have to be able to truly take part in this technological revolution. Touching ‘windows’ and rifling through menus is still the order of the day and to many feels perfectly adequate, but to myself I cannot help to feel that this is one day going to be an archaic relic of the technological revolution. We need things like Siri to begin that step on getting away from all of that. The idea that we can literally talk to a computer to achieve complex tasks in a much shorter space of time and having to know virtually nothing to do so will be when the tech revolution really kicks off. The day when it truly comes of age is when we no longer see the technology, no longer realise the complexities behind it and it just becomes a part of the fabric of society, of us, making life easier all round and a more beautiful and joyful experience for everyone. I think it could be great, and I say it will take another 50 years at most to get somewhere there looking at how fast things have come along even in just 20 years. TV controlled by Apple? No thanks. And they don’t have the capacity or knowledge to build TV’s. So in the end it is going to be a Samsung TV which will be twice as expensive because it has an Apple logo on it. OMG… NOOO!!! iTunes is crap and needs to be scrapped. Why are they are turning to arguably one of the worst designed apple application’s engineer? @icebreaker – by that statement, Apple had no knowledge or capacity to build iPods, Tablets, or Phones… Now they have the hottest selling of all 3… Who’s to say they can’t do a good TV? If they are indeed jumping into TVs then they probably have some kind of new tech that “changes everything… again”. If it wasn’t for that book I don’t think anybody would be talking this much about an Apple branded tv. Steve said “simplest interface”, rumor says developer of Itunes…. Pick one! I disagree Icebreaker. Apple has been working with computer monitors since the outset of the company. More recently they have put tremendous work into recent display quality. The Thunderbolt monitor is just the latest. They easily have the know how to designe a TV. The real question what “else” they will be designing into it that a set top box alone can’t manage. Unless your a TV junky you dont buy many TVs very often. Over the course of my parents life they’ve had 3 TVs thus far a dinky little black and white, a color Zenith my grand baught them cause he wanted to watch the Lakers play in color, and about 10 years ago a then modern CRT TV because the Zenith kicked bucket. There needs to be something REALLY super about a full blown Apple TV to make it survive the market. I don’t think Siri will be enough. Harware lockin is an issue. One can replace a $99 set-top box every 2 to 3 years for the latest upgrade… A TV is a totally different story. The only way I see this being effective over the long haul is if the primary guts of the TV are actual an insert-able kinda like an iPod Nano sized card with all the processing and storage that can be replaced at a lower cost then the whole set. An Apple based TV doesn’t make much sense to me. What does make sense is Apple replacing their 27″ Displays with ones that have Apple TV built into them. I yet have to understand how will that be different than my current TV with is very small apple tv box plugged to it. Removing the small box? Meh.